In November, the Migratory Bird Conservation Commission approved 24 North American Wetlands Conservation Act (NAWCA) grants, two of which are funding projects within the PLJV region. 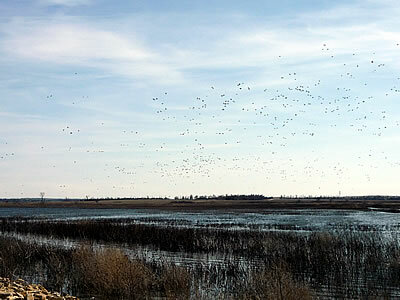 Ducks Unlimited received two $1 million grants for projects that will provide 15,680 acres of bird habitat in Kansas and Nebraska. The Kansas Prairie Wetlands project will acquire, restore, enhance and protect wetlands, grasslands, and riparian areas on McPherson Wildlife Area, Quivira National Wildlife Refuge, and The Nature Conservancy’s Cheyenne Bottoms Preserve. While the primary focus of the Central Migration Corridor project is on the central Platte River and the Rainwater Basin area, the watershed-scale restoration project also includes portions of Jamestown Wildlife Management Area and Talmo Marsh in Kansas. These two projects include a number of important wetland complexes that have been identified as areas of significance to North American waterfowl, shorebirds and other wetland birds. The wetlands provide critical migration stopover habitat and create links between Prairie Pothole breeding areas, Rainwater Basins, and wintering habitats along the Gulf Coast and in the High Plains playa region of Texas. “Restoring these large seasonal marshes and wetland complexes to what they once were is critical to supporting the millions of migratory waterfowl, shorebirds and other wetland-dependent birds. It is especially important during spring migration when they need to rest and replenish their energy reserves before continuing on to breeding areas,” says Christopher Rustay, PLJV Conservation Delivery Leader.